Shawl collar cardigan: 41-46cm 100g, 51cm 150g, 56-61cm 200g, 66cm 250g. 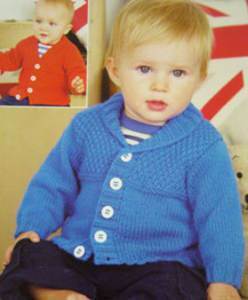 V neck cardigan: 41-46cm 100g, 51-56cm 150g, 61cm 200g, 66cm 250g. 22st/ 28 rows to 10cm, 4mm needles. Other suggested yarns Sirdar Snuggly DK, Kisses DK, Sirdar Baby Bamboo - quantity may vary. 3.25 and 4mm needles, 3.25mm circular needle. 41-51cm 4 buttons for V neck cardigan, 5 for shawl collar: 56-66cm 5 or 6 buttons.